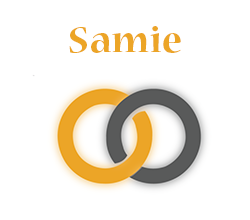 Samie - SignOn - Connect. Practice. Retain. My Name is Samie. I am Deaf, and I grew up In Holly, Michigan. I attended RIT in Rochester, New York. I love to go camping and vacation in California. I have a Deaf dog. She is the most amazing dog ever to my husband and me. I really look forward to working with learners and parents on SignOn, and helping to improve their signing!